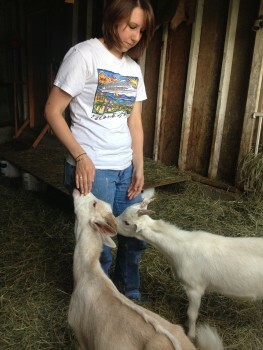 Mountain Girl Farm is the brainchild of Katie Barbeau, who (with the support of her mother, Jen) started on her dream to raise goats in November 2013. After taking out a loan for their five-acre farm at 1360 South Church St in North Adams, the mother-daughter duo found themselves buying their first goat for $10 after hearing it would soon be sent to slaughter. “Things just took off from there,” Katie says. 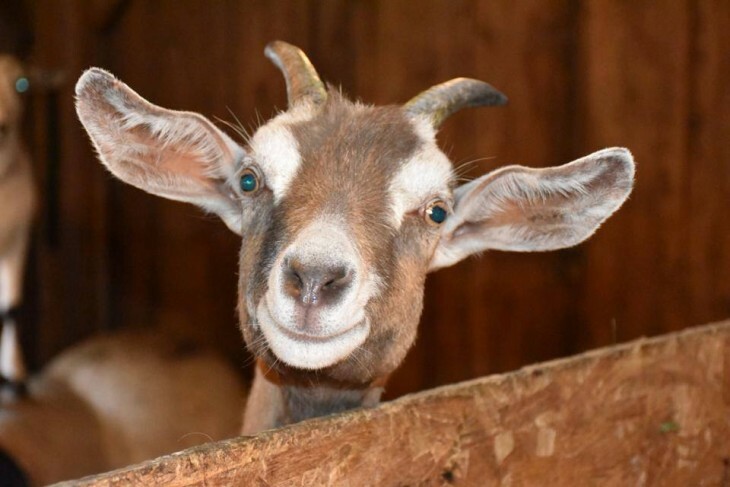 With help from friends and neighbors, Katie and Jen installed a fence around the barn that is now home to eight goats, a handful of ducks, and a flock of chickens. garden plot. Their soap contains only goat’s milk (from their forage-fed, hormone-free goats) and all-natural non-fragrance oils, and has quickly become their biggest seller at markets. Katie explains that goat’s milk is closest in structure to human milk, making goat milk soap especially compatible with our skin. 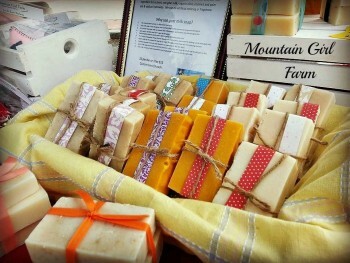 They’ve already had a Pittsfield dermatologist recommend Mountain Girl Farm’s all-natural goat milk soap because it exfoliates skin, leaving healthier and smoother skin cells, and also contains skin-repairing vitamins and minerals that may prevent skin cancer. Engaging with their surrounding community has been a priority for Mountain Girl Farm since its inception. They welcome anyone who wants to stop in and pet the goats. During the holidays, they invite local residents to recycle their evergreen trees on the farm, where the goats will devour a tree a day. In the aftermath of Halloween, they encourage locals to drop off their sagging jack-o-lanterns too, which share a similar fate. 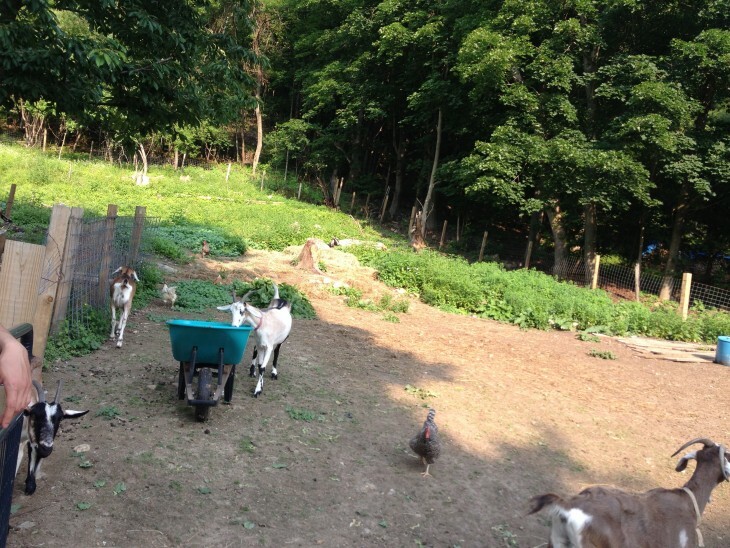 Some farms donate leftover produce to feed the animals, and some locals regularly bring their own food waste. Although the pair is brand new to farming, Jen grew up around horses, so she says she “doesn’t mind standing in poop!” Jen says that taking care of the animals is therapeutic for her: “You can’t be in a bad mood when you’re milking – the goats pick up on it. You can’t carry in any stress or frustration. We let all that go as soon as we pull up into that driveway.” It seems like Jen and Katie take all of their challenges in stride, and embrace the reality that making mistakes is a big part of learning how to farm, as well as learning how to ask for help.